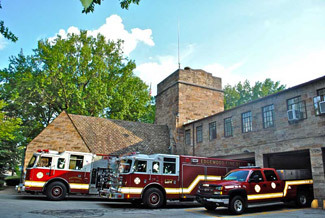 Originally formed in the late 1880s, the Borough’s Volunteer Fire Department operates out of a single station located behind the Edgewood Borough Building, proudly protecting the residents of Edgewood Borough. The EVFD responds to calls of every type, handling emergencies such as fire, medical, vehicle accidents, rescue, hazmat, and water rescue. As of December 13, 2005, all emergency calls for the EVFD are being handled and dispatched by the Allegheny County 911 Center. Response times are under two minutes anywhere within the Borough. When a call is received by Allegheny County 911, pagers and cell phones are activated that alert members to respond. Although the EVFD is a respond-from-home department, due to the atmosphere of the department and the camaraderie between the members there is almost always a full crew in station, ready to respond to emergencies. The Edgewood Volunteer Fire Department is capable of handling more than just emergencies. Along with responding to calls, the EVFD is dedicated to community outreach and fire prevention. For the most current programs and to sign up for the mailing list, please visit our website. In addition to protecting the residents of Edgewood, the EVFD also is also tasked with the responsibility of the Penn Lincoln Parkway (I-376) between the Squirrel Hill Tunnel and the Forest Hills exit, the Western Pennsylvania School for the Deaf, Edgewood Town Centre, Regent Square, a stretch of the Port Authority Bussway, and a stretch of the Norfolk Southern Railroad. 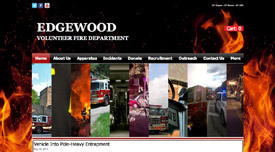 Learn more about the Edgewood Volunteer Fire Department at their website - EdgewoodFire.com or visit them on social media.